In November 2016, my novel Belief was published and launched at Toronto’s Gladstone. I’ve written rather extensively about it in different places (including here) and so it’d seem bit of an overkill if I repeat myself. 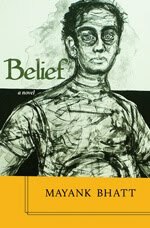 But I do want to acknowledge the contribution of MG Vassanji to making Belief what it became. Although I’d taken several years to work on the various drafts, there were a number of loose ends in the final draft. Vassanji rejected the conclusion of my draft – which he felt was heavily influenced by Hindi movies – and suggested that we leave it more open ended; he also made Jameel, the son-in-law, a rum-swigging Caribbean. In addition to these major modifications, there were a number of minor ones, as well. He made me work on the first chapter more than a dozen times and even then, he continued to say that he wasn’t satisfied with it. It’s mistakenly believed that writing is a gift one is born with and that it cannot be taught; my experience with Vassanji was different. His observations, comments, opinions on my drafts helped me improve my story, my characters, the pace at which the story developed. He did all this almost always patiently, often imperceptibly; occasionally sarcastically and at least on a couple occasions quite sharply. The day my novel was launched was one of the most important days of my life; in retrospect, only a few days match up. For me, it was important that Mahrukh, Che and Durga were with me at the launch event, and my sister Sonal enthusiastically ordered a dozen or so copies online from Barnes and Noble; other members of my family in India and the US also went out of their way to buy a copy, as did many of my friends. Thanks to all my friends, I was also invited to a number of readings and book events between 2016 and 2018, including at the prestigious Harbourfront, and at the Festival of Literary Diversity (FOLD) in Brampton. The FOLD festival participation in 2017 was a grand experience. Mahrukh and I were provided a hotel room in Brampton for a couple of nights. It was the first time in many, many years that we were in a hotel room together. Since his birth, two years after we were married, Che had accompanied us everywhere we’d gone. Now, although only 19, he decided that he was too old to be with us. At the FOLD festival I met many outstanding authors and creative people, the most memorable was, of course, Eden Robinson, the much-awarded novelist with a hearty laugh. Mahrukh and I had lunch with her at a Thai restaurant on downtown Brampton. Her novel Blood Sport (the only novel that I’ve read) is raw, gritty, violent. 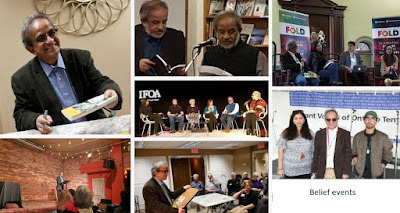 FOLD Festival is in many ways similar to the Festival of South Asian Literature and the Arts (later renamed Toronto Festival of Literature and the Arts) that Vassanji and Nurjehan conceived and organised once every two years between 2009 and 2015. But FOLD is a better funded effort, and Jael Richardson, the founder of the festival is able to attract a wider participation from local Canadian authors. 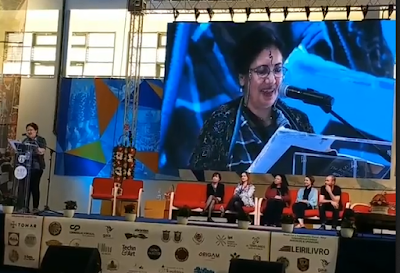 By focusing on authors whose works are freshly published, the festival has an immediacy that gives it a buzz. By 2016 December, my dentist in Toronto Dr. Anant Seth convinced me that it was time for me to remove all my teeth and move from partial to complete dentures. That transition would occur in early 2017. When I was in my 20s, I remember reading a book which had a sentence, “as common as a 13-year-old wearing dentures…” I don’t remember which book that was, but I do recall, my eyes moistening. I was 13 when Dr. Chouhan extracted most of my teeth except the molars. He then put plastic teeth both on the upper and lower jaws. For the first time in many years, I was finally able to bite and chew properly. Me and my dentures have a long back story. After my milk teeth fell, the new teeth that emerged were ill-formed, spirally, crooked, sharp and uneven. My parents tried all sorts of medicines for it, including homeopathy, but nothing changed the deformities in my mouth. Then, finally, in 1975, exasperated with the situation, they consulted Dr. Chouhan who recommended partial dentures. I’d lived with partial dentures through my adolescence, teens and youth. Periodically, I’d have to get them changed as I grew up and the size of my mouth changed. When I was in my early 20s, Dr. Mohan changed the removable partial dentures to permanent, fixed dentures. And then when I was in my late 30s, Dr. Rajiv Khanna, a young man, recommended gums tissue graft surgery because constant wearing of dentures for so many years had resulted in gums reversal. Dr. Anant Seth is the fourth dentist in my life so far. All of them have had an affable personality. Dr. Seth recommended, with all gravity he could muster, that if I didn’t change to a complete set of removable dentures, it could well have dangerous consequences. I didn’t think much about it before agreeing because dentures had (and have) always been a part of my life. However, something significant did occur in 2017 when I began wearing full, removable dentures – I no longer felt it necessary to hide that I wore dentures. I’d not necessarily hidden this fact; after all I’d been wearing dentures since I was in my teens, but now I was talking about it more openly and more frequently. Sometimes, I see the look of disbelief on some of my friends and acquaintances when they realise that I wear dentures. I take time to explain to them that it was because of the strong antibiotics that I was administered as a six-month-old when I got pneumonia which most likely caused my teeth to grow deformed leaving no choice but to wear dentures. Another, perhaps more dangerous outcome of the pneumonia was the swelling on my kidneys, which five decades later, developed in a full-blown kidney disease, requiring constant monitoring. If all the years in the last decade (2008 – 2018) were significant in some ways, 2016 was the significant for my debut novel and for my kidney disorder. 2017 began with me losing all my teeth. The forthcoming Indian elections are dominating the mind space globally. India’s Prime Minister Narendra Modi will return to for another five years up to 2024. Modi’s Bharatiya Janata Party may not get the absolute majority it got in 2014 but the coalition of disparate and often disputatious political parties under the umbrella of National Democratic Alliance will form the next government. 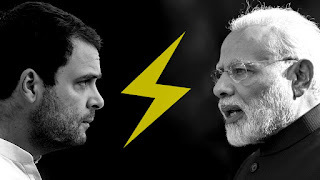 Although the Hindutva brigade will hail the narrow victory as the continuing supremacy of their beloved leader over the Indian masses, in reality it would be no more than a repeat of the two-term tenure of the United Progressive Alliance government from 2004 to 2013. And, the phrase that Dr. Manmohan Singh, India's former Prime Minister, coined, “coalition dharma” will return to be the guiding principle for Indian democracy. If coalition politics returns, will it affect Narendra Modi’s chances of returning as the Prime Minister? It doesn’t seem likely though it would be an entirely welcome development were it to actually materialise. But with the BJP losing its absolute majority, there would be hopefully some modification in the manner in which India has been governed during the last five years. A possible scenario that shouldn't entirely be ruled out is the joining of forces between the Congress and the other opposition parties who have formed the Mahagathbandhan. For all his promises of less government and more governance, the Modi era so far has been nothing more than crony capitalism, the tag of ‘Suit boot ki Sarkar’ is justified even though Modi acolytes are at pains to defend all of his actions and not subject any of the claims to scrutiny. In addition, of course, the Modi government has turned out to be blatantly anti minority – with ceaseless lynching of Muslims and Dalits for killing and consuming cow. The unapologetic, unabashed and virulent hatred that is spewed by the Hindutva proponents against their perceived enemies is both unprecedented and frightening. Opponents of this brand of extremism are always called anti-national, and pro-Pakistani. Their representatives in the diaspora are eager to hunt down all opponents of the Modi regime and silence them by gravely emphasizing that criticizing Modi tantamounts to tarnishing the image of India in foreign lands. Two recent programs in Toronto dissected the upcoming elections and the rapidly changing socioeconomic and political dynamics in contemporary India. 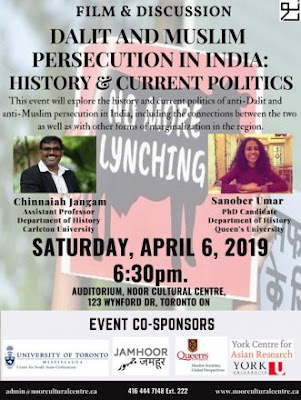 The first was in March at Toronto’s Munk Centre where Ramesh Thakur, academic and a peacenik, along with Haroon Siddiqui, one of North America’s finest journalists, got together to discuss the Indian elections. Their session’s title 'An Infuriating, Loveable Democracy' was a clear indication of the even-handed, non-judgemental assessment the participants would accord to the Indian elections and the sociopolitical situation. The second was at Noor Cultural Centre where academic and Dalit activist Chinnaiah Jangam and academic and human rights activist Sanobar Umar participated in a discussion on Dalit and Muslim Persecution in India: History and Current Politics. 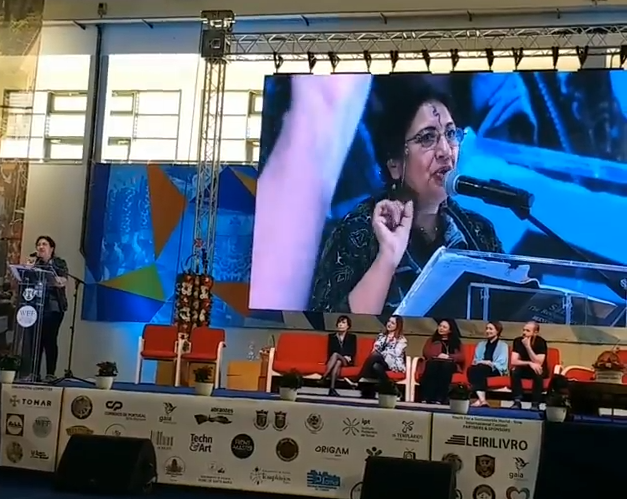 This discussion – expectedly – turned out to be controversial because right-wing Hindu extremists swarmed the venue and tried their best to prevent a healthy debate. Here’s a brief report on the Munk Centre event. What happens in India in the next 10 years will have a strong impact on Canada than what the Canadian government does. Intergenerational improvement in the standard of living that western societies are accustomed to is not going to be possible purely on the growth rates of western economies; these economies will have to depend upon the consumption patterns in the developing, emerging economies, especially India. Incremental reforms and even moderate growth of 6 to 8 % will add up to a transformative impact on India, Asia, and the world. India is the world’s fastest growing economy; the present dominance in global economy will be taken over by India. 20 million people are added to the workforce every year and therefore economic growth is vital for India. He felt that while there are many things working for India, it will have to continue taking proactive decisions to sustain the transformation of its society because, paradoxically, India also has the largest percentage of poor, hungry, sick, homeless, illiterate, underweight, stunted, raped, exposed to pollution. Thakur said Indian society is multiethnic, multireligious, democratic; and federalism and secularism are inherent to the Indian nationhood. If you take away even one of the above, you will destroy India. Referring to the Balakot incident, Thakur said, this was the first example in history where two nuclear armed countries have had a dog fight. He cautioned that even a limited regional nuclear war between India and Pakistan will have global winter for a decade and globally, 2 billion people will die. And for the first time, the US has sided with India. He concluded with an observation that democratic institutions in India are resilient, proactive and agile. It was an observation that is not supported by any recent evidence. Increasingly, too, the cliché (which Thakur also repeated) that Indian people are secular doesn’t stand to scrutiny. Haroon Siddiqui in his brief presentation said that in the early 20th century, the common global refrain was that India and China won’t make it big because they had a large population. It is only now that economists have realised that large population is good and acts as a buffer against economic depression. India will need to grow at 7 to 8 % if Modi will have to fulfil his promise of 10 lakh jobs a year. He said the Indian election involve large sums and during the last general elections $5billion had been spent. Add to this is the utter lack of transparency of the system. Siddiqui said that the Pulwama incident had given rise to nationalism among Indians. Indians are angry and united against constant attacks carried out by terrorist organisations based in Pakistan. But there is a growing fear that nationalism will turn into jingoism. The presentations by Thakur and Siddiqui were followed by a lengthy Q&A where members of the audience asked pertinent and pointed questions. I refrained from asking a question during the Q&A, but on the way out, I briefly detained Thakur and asked him how he would explain the Supreme Court’s decision to release Babu Bajrangi, the prime accused in the 2002 Gujarat riots in the context of his assertion that the Supreme Court was proactive and agile. Thakur didn’t respond. The Noor Cultural Centre event began with a series of video screenings of both Indian and international news reports on the lynching spree that suddenly erupted across northern India after Narendra Modi’s ascension to power. Aparna Sundar of York Centre for Asian Research introduced the discussants – Sanobar Umar of Queen’s University and Chinnaiah Jangam of Carleton University. 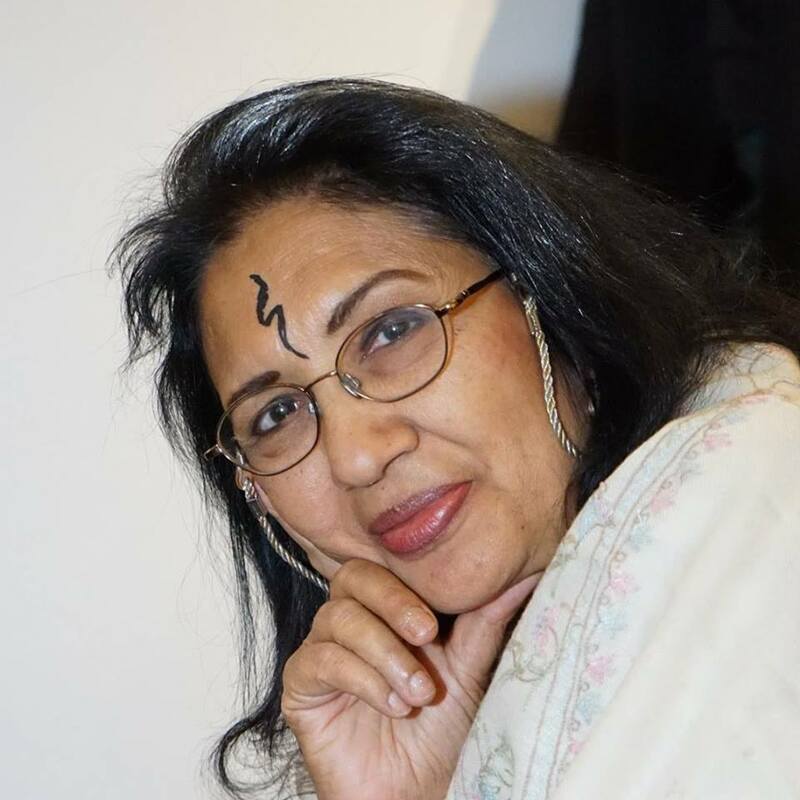 Sanobar Umar read a piece she had especially written for the program; it was a straightforward reiteration of the atrocities on Muslims and Dalits by the proponents of Hindutva. She emphasized that she made a clear distinction between extremists and nationalists. Sanobar said it would be erroneous to call the proponents of Hindutva proponents as Hindu nationalists because nationalists who fought for the freedom of India did not believe in the narrow interpretations of caste and religion; they strove hard to represent all Indians. On the other hand, the Hindutva proponents are Hindu extremists who are exclusivists. She said, during the Q&A session, that the Indian state has actively ensured either through legislation or through judiciary that the Indian Muslim stays casteless. Chinnaiah Jangam’s presentation was an in-depth, studied look at the history of exploitation of the Dalits in India. He said the event was the first in North America to discuss the Dalit-Muslims suffering and violence. Jangam said that today, the Dalits have truly arrived on the Indian political and social scene. “You can neither suppress us nor silence us. Tracing the history of the rise of Dalits, Jangam said the rise of Dalit literature (which began in the 1970s in Maharashtra) spread across all Indian languages in 1980s and 1990s. This created awareness among the Dalits of their status in the Indian society. He said Ambedkar was aware of the non-egalitarian nature of Hindu religion and had termed the caste system as a division of labourers and not as a division of labour, as the upper caste Hindus have often defined it. It is because of this inherent hierarchical nature of Hindu religion that is not into proselytizing, despite all the claims of ghar wapsi, because a Hindu has to belong to a caste. Jangam said the privileges that the Hindu upper castes enjoy make them insensitive and inhuman to the sufferings of caste and religious minorities. The Manu Smriti codified the Hindu caste system and denied knowledge to the Dalits, monopolising it exclusively for the Brahmins. He said that despite the concentration of power in the upper castes, and especially the Brahmins, the history of Hindu religion is replete with resistance against the upper caste dominance. Jangam said the effect of colonialism globally was the destruction of indigenous cultures, but in India, caste and colonialism colluded and it is during the colonial period that there was a sudden discovery of the rich and glorious history of Hinduism and that led to the assertion of the Brahminical supremacy. Colonialism consolidated and strengthened the caste system. The Dalit voice was suppressed. In the grand nationalist narrative, the Dalits obviously wanted to know where are we in this narrative? He said after independence, the makers of modern India had a vision of a new India that would be a home for everyone. Only in India can one find such an example – one cannot conceive that a black person would be invited to write the constitution of the United States, or a native person is invited to write the constitution of Canada, but in India, a Dalit was entrusted with the task. The Indian Constitution is one of the most egalitarian documents and the primary reason for this is that it was prepared by a Dalit. Jangam said, Ambedkar emphasized that while the constitution guaranteed constitutional equality, the Indian society continued to ensure that there was no social equality. Talking about the present crisis that the Dalits and Muslims face in India, he explained that in the past, the educated Dalit was a target of violence because she is a threat to the caste system. But the last few decades the Dalits have closed the gap and the condition of Dalits is much better than the condition of the blacks in the US. And that is the reason these days it is the poor Dalits who are the target of the ire of upper caste Hindus. Laws such as the SC ST Atrocities act are unique with no comparable legislation anywhere in the world. And therefore, any dilution of the act should be resisted. The Q&A session turned out to be confrontational with a number of right-wing Hindutva proponents questioning the basis of organising the discussion. Jangam had a great answer to their protestations: Organise your event. Artists are change agents and by nature have a sense of sustainability as leaders. Art touches the very core of humanity. Therefore, art as a path to global consciousness could be a great unifying tool because of its collective nature. As an artist and creative writer, I know that my world is in a constant change. It is always facilitating and trying to be the catalyst of innovations, bringing awareness to the issues that matter and hoping to bring about change and even just raising awareness on many issues. Alex Grey, American Artist says, “Art is an echo of the creative force that gives birth to galaxies. Creativity is the way with which the cosmos evolves and communicates with itself. The great uplifting of humanity beyond its self destruction is the redemptive mission of art” - The artist channels the creative force into the artistic work and the work then turns into a kind of charged battery, ready to zap the imagination of the viewer into the new way of perceiving the world. This is how global consciousness becomes cosmic consciousness through human consciousness and becomes a unifying factor to humanity. Therefore, throughout history, art has been a major instrument in transforming human consciousness and revolutionizing societies. It is in its nature political, because it represents a voice that will not be compromised and faded easily. If I speak of sustainability in Canada, concerns about environment have been enormous in general with all creative people and artists and more so amidst our 'first nation artists' whose heritage lies within the land. They are close to earth and to the nature. Urban land has also been a concern of many artists. Vancouver school of photoconceptualism deals with the subject of how it is to be living in an urban environment. They are also dealing with the subjects like racism, immigration, poverty, hunger, riots etc. Canada is also a homogeneous and exceedingly diverse society in constant progress while meeting global challenges. Now, some artists want to explore the eternal question of just ‘what is art’ while delving into the recesses of mind in search of that unifying factor, while others want to protest with the things that they disagree within the society like the over consumption of the material goods and social inequalities. Many aboriginal artists are using modern and traditional techniques to express their ideas and concerns about sustainability. Persistently fighting the stereotypes, trans-cultural, transnational, not fitting into a box, multi-positional, shape-shifting reality that many of us in Canada feel and face. There are series of negotiations that are constantly happening in this multidimensional network that we have. With all this Art power is emerging as a powerful global consciousness. Art is giving the consciousness, the ability to understand the global, international, and cross-cultural sources, interconnections, institutions, events, and actions. Most important, it gives value and validity to the diversity of every type while demonstrating open-mindedness and acceptance, also effectively in settings and situations where language and culture are diverse and native. All this comes naturally to the people who are in creative fields. Artists as global citizens are generous. Technology plays an immense role because it has made the entire world a global village. This technology also plays an important part in artists advancement of the work as global citizens. I perceive technology both as an artistic medium and also as a powerful global communication tool as it can be instrumental in giving art a global voice.